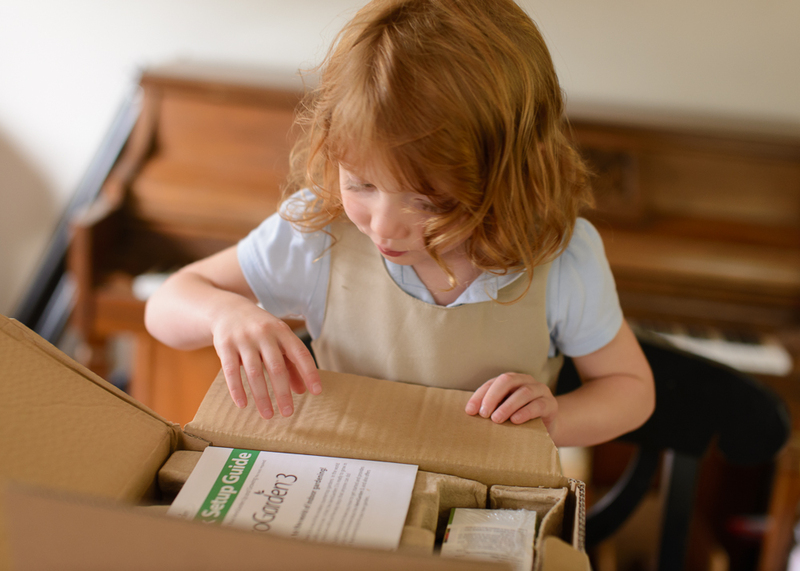 Caroline likes getting mail ALMOST as much as I do, so the box made her very excited. Then I told her it was a magic garden and she was SUPER excited. It came in a bunch of pieces that just snap together, no tools required. The assembly took 5 minutes, and that’s with me stopping to take pictures. The garden requires no dirt, no weeds, no sunlight, and very little space. Mine is set up next to my Keurig, since the kitchen island is apparently where I keep my life-changing super technology devices. 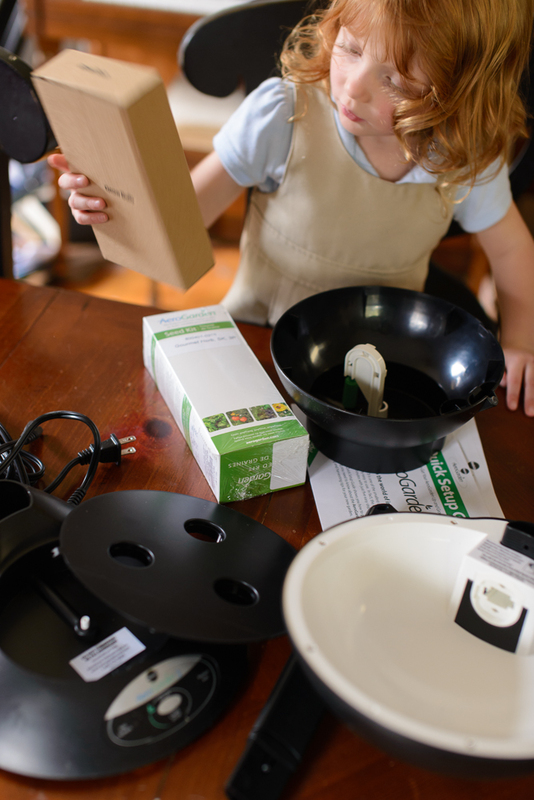 My garden kit came with a 3-pack of herbs, but you can grow tomatoes, salad greens, peppers, cherry tomatoes or even flowers. 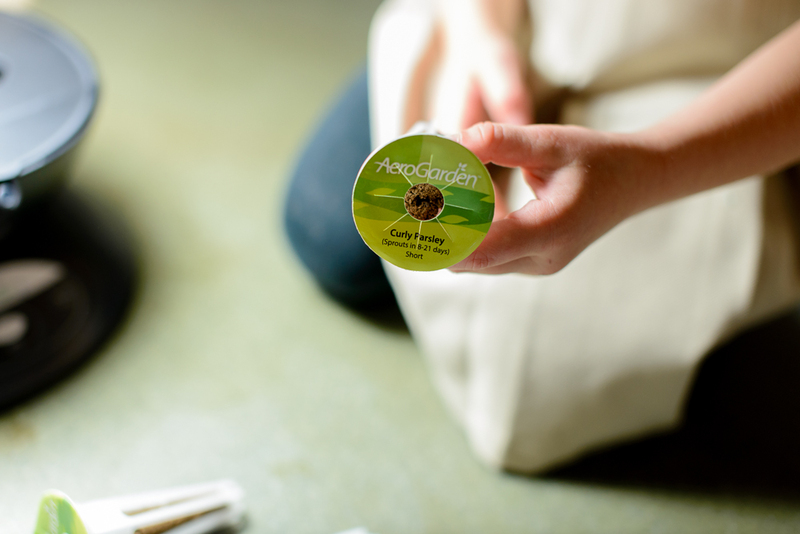 Things planted in an AeroGarden grow five times faster than in soil, so you can enjoy your plants sooner. I can’t wait for fresh basil all winter. That’s how easy it is: you fill the base with water to the fill line. You add the magic growth plant food (it’s made by MiracleGro! Of course there’s magic plant food!). Then you pop the seed pods into the holes. 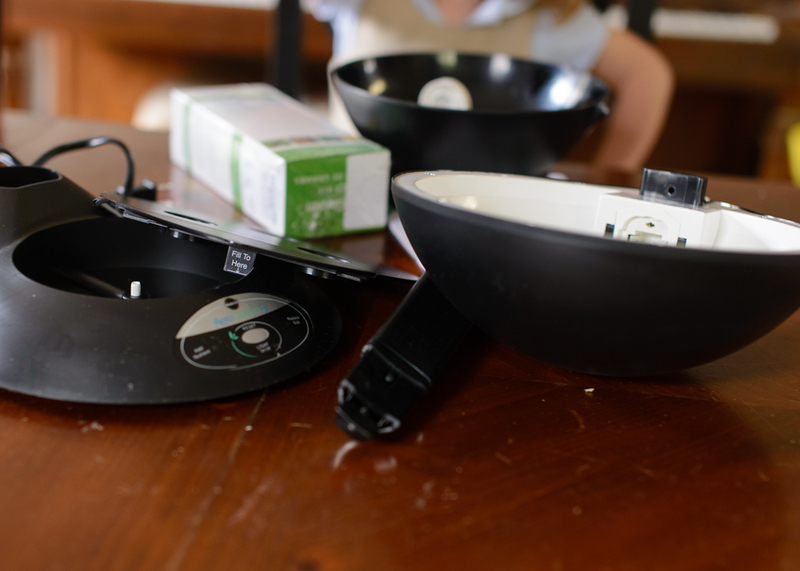 It tells you when you need to add water and when it’s time to add more food. 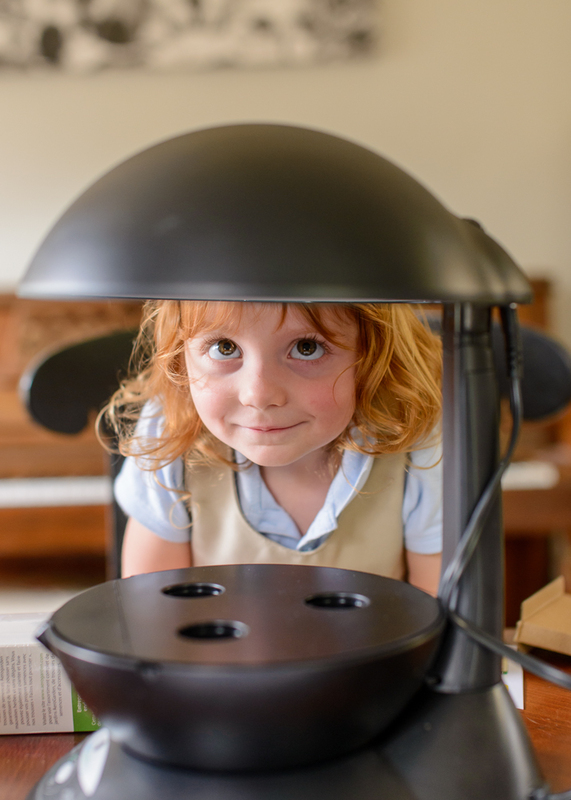 The energy-efficient grow lights turn on and off on their own to mimic sunlight. And then you sit and watch the plants grow. If you’re Caroline, you check on them CONSTANTLY to see if they’re growing yet. 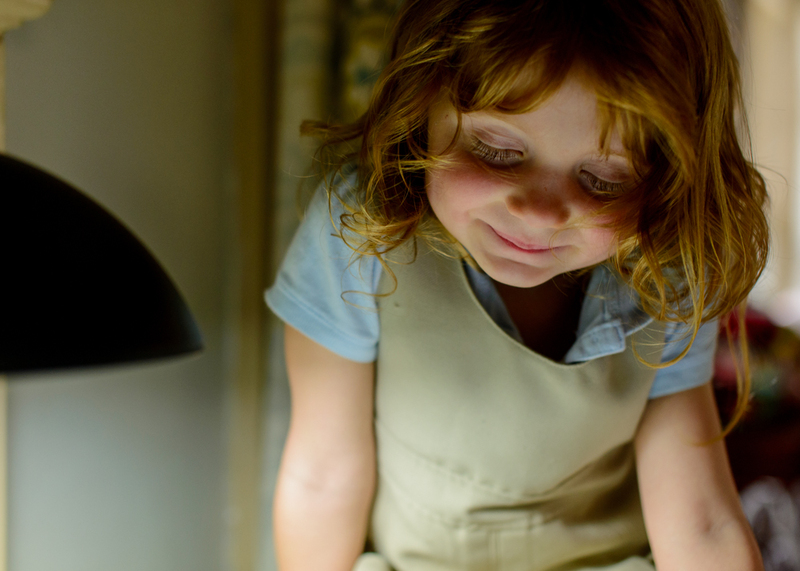 She gives me updates on the lights all the time – “Mommy! The garden light is off! The plants are sleeping!” – and I’m pretty sure she’s going to eat the heck out of the parsley when it’s ready. The little plastic caps over the pods create mini-greenhouses. You leave them on until the plants are big enough to touch them, then take them off. So on top of adding water occasionally (I haven’t had to yet) and adding food every 2 weeks, the caps are the third thing. Three things you have to do to grow plants, and the garden does all the rest. Their website has TONS of good tips and info to answer almost any question (what’s this weird white stuff growing on my chive pod??) so check it out if you want more details. 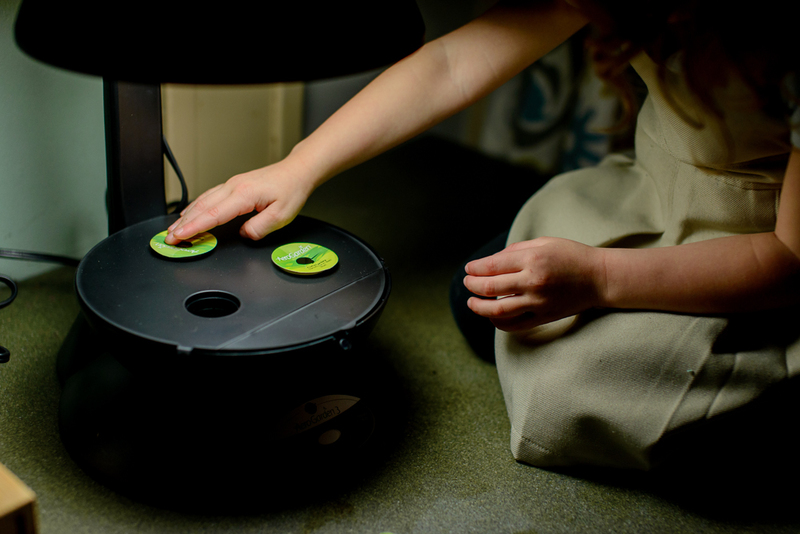 An AeroGarden would make a super holiday gift for someone who loves to cook, someone hard to buy for or even someone with kids who might love it as much as mine do! I’m wicked excited about my AeroGarden, in case you couldn’t tell. And I’m even more excited that I get to give one away to one of my readers! 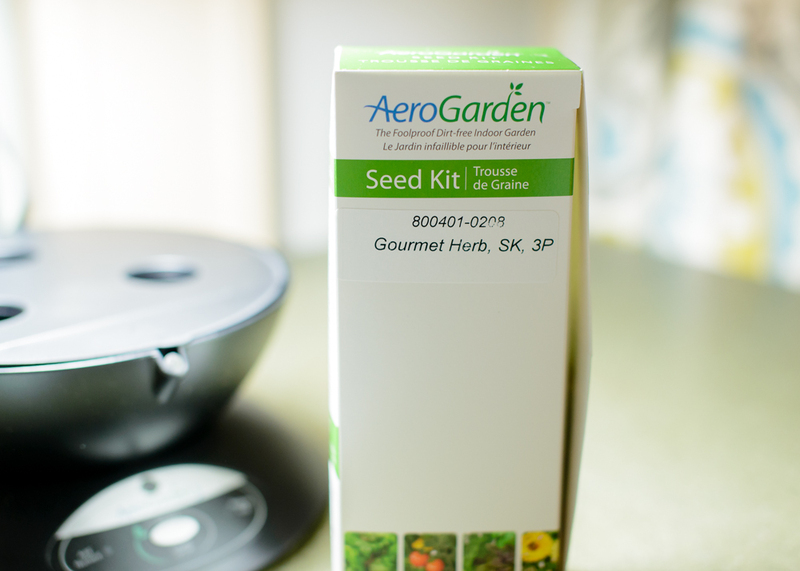 All you have to do to enter is leave a comment on this post telling me what you want to grow in your AeroGarden if you win! And look! I spy some tiny basil already sprouting. Giveaway open to residents of the USA age 18 and older. Prize furnished by Scotts and MiracleGro. Be sure you use a real email address so I can contact you if you win! Giveaway will end November 30th. I have wanted an aero garden forever but the price has always kept me from taking the plunge. Fresh herbs in the winter always sounded so enticing. Salad greens growing on the counter… Maybe we would eat salad more often? I hope you do an update when there is actual pick able herbs! There will definitely be an update, it’s part of the deal for trying it! Or you guys can just come over for dinner and I’ll make something basil-y. Sounds like a plan. Soccer season is finally over and you guys will be celebrating shore duty soon enough correct? It’s shameful how much of a black thumb I have, considering my grandparents used to own a flower shop with an enormous greenhouse in the back of it. I certainly didn’t get the “garden gene” from them. 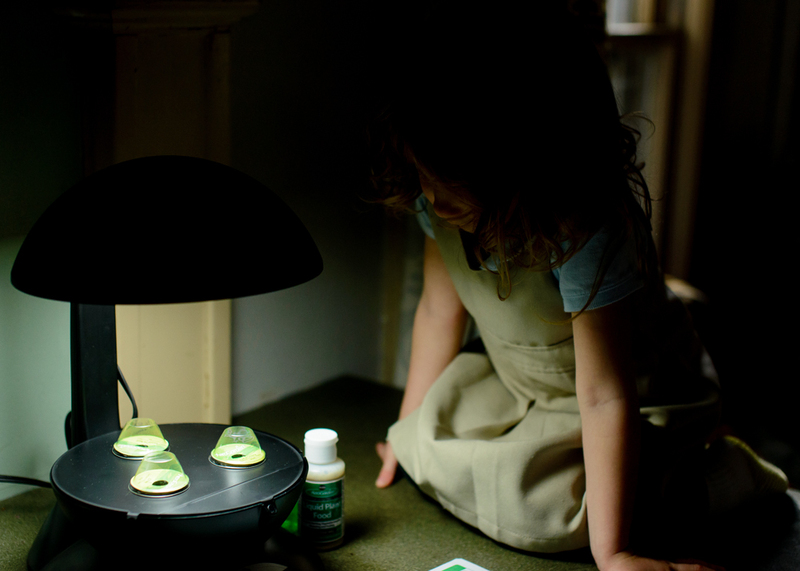 Maybe the AeroGarden will help me overcome that “shame”. LOL. Would love to grow some herbs for cooking, or some pretty flowers for winter cheer! Oh how I would love to try this! I cannot keep anything alive either and it would be amazing to have basil that stays alive (I’ve killed no less than 10 basil plants), maybe some mint? Rosemary? The options seem endless but it would be an herb garden for sure! This is the coolest thing! My daughter would love it. This winter we’d be all about planting fresh herbs. I’m thinking basil, chives, and cilantro to start. I’m not a big fan of cow stuff, but for whatever reason, the spotted cow AreoGarden is calling… mooing? to me. So cool! My kids (and I) would love this! I’m torn between wanting to grow salad greens or tomatoes. Seriously, though, how awesome would it be to eat a fresh tomato in the winter!?! I love this so much! Fresh basil for pesto and spaghetti sauce would be awesome. I’d love to try planting some herbs too! And we could actually have indoor plants that our cat wouldn’t eat! Win/win! This is really neat! 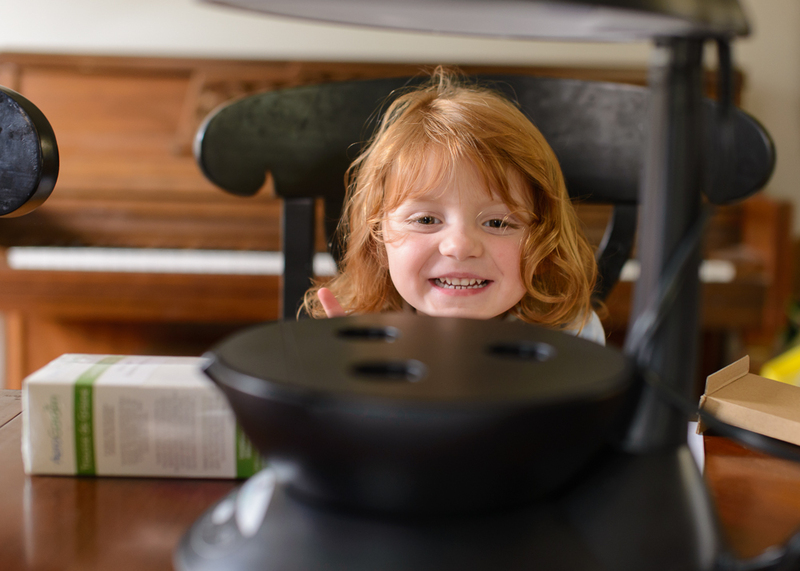 My 2 year old was my garden helper all summer… she’d love to help with an AeroGarden too! Salad Greens all winter long! Awesome! I would totally grow herbs all damn winter! Mmmm..Basil! I’d love to grow some herbs year round! I think my neighbors have one of these…cause i’m creepy and have noticed it in their window, haha! I’ve been despairing that no room in my new apartment gets direct sunlight, so there go my dreams of growing herbs on the balcony and no longer paying $2 for three-quarters of an ounce of basil at Harris-Teeter. I’d love to try this, though. Okay, our house is plant hospice, so I totally need one of these! I wat fresh herbs with little effort! My son (6 yrs) would love this! We’ve been wanting to try to grow cherry tomatoes since he eats them like candy. I LOVE to cook and keep plants and have always wanted one of these. They look so fun! Seems awesome to have fresh herbs all winter long! I am also a killer of plants (RIP to a recent Sage plant that I received at a friend’s bridal shower) so this looks awesome. I’d love to grow basil and cilantro! I can’t keep plants alive either! I would definitely grow basil in one of these!! Ah, I love this! Maybe if I grew salad supplies (greens! tomatoes! peppers!) I would eat them more. Super cool though. I missed my time frame for planting tomatoes this year and I’ve been so sad! My kids would adore this!! We would grow herbs for the winter. Who wouldn’t want fresh basil in February?! I sooooooo want to try this since my house gets no sun during winter time. I really want to grow “Tiny Tim” tomatoes, basil, and parsley all together for my salads. Tiny Tim stays nice and short so I think it’s perfect for this contraption! Cilantro for fresh salsa all winter. Mmmm. 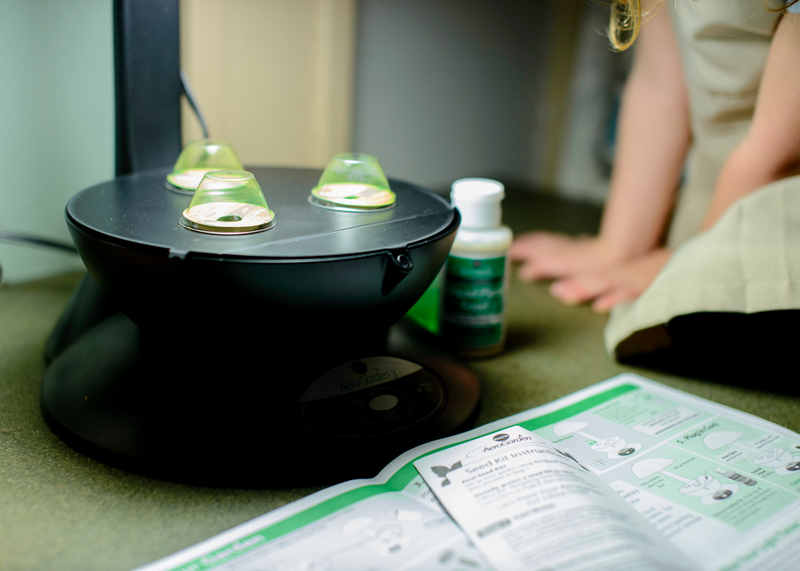 I would love an Aerogarden to grow parsley, oregano and thyme to spice up all the new healthy food I eat. I’d grow some herbs for hubby to cook with! parsley and such. I would like to grow some basil and lemon balm in my new AeroGarden if I was to win this. 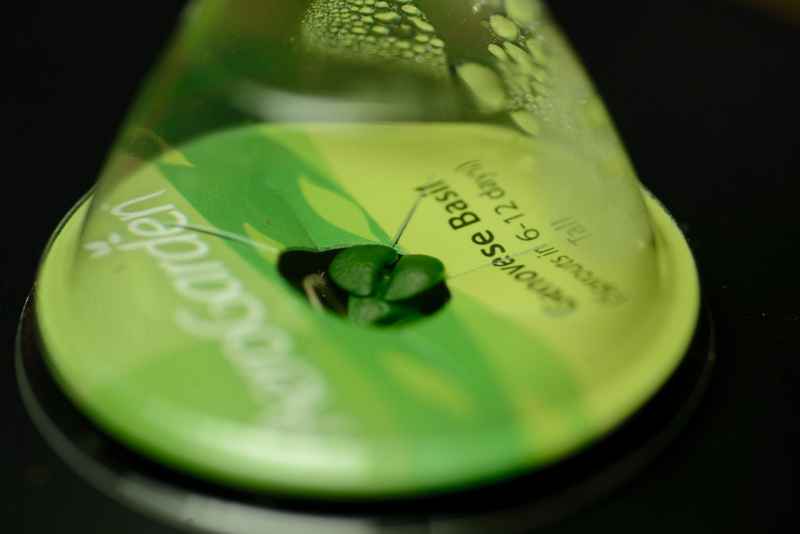 This would be great – I have a hard time keeping my solo basil plant alive in my dry NYC apartment! The garden of the future is for me! I want one of these so bad. I want to grow basil and parsley and chives!! YUMMMMMM!!!! Oooh! Herbs 365! That’d be amazing. Oh I would love to have cilantro and basil to remind me of what’s coming next! Fresh salsa and bruschetta… Two summer favorites. I’ve been looking into getting one of these for my nephews. Thanks for the review. And so many comments, too! That alone says a lot. 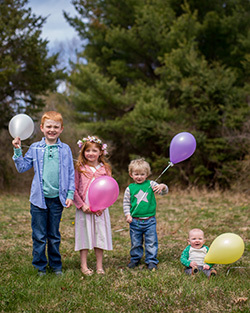 Think I’ll finally make the plunge when their birthday comes up in two months (twins).